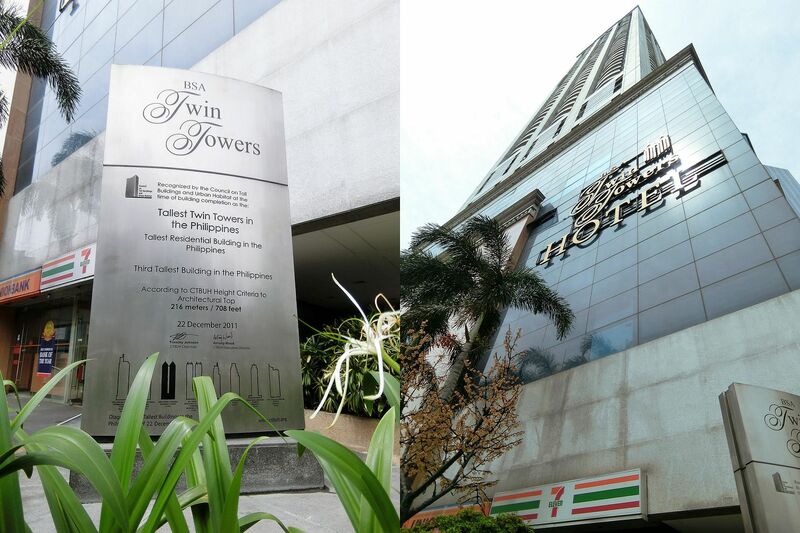 Real Asian Beauty: BSA TWIN TOWERS Blog Review | Affordable Staycation in Manila! 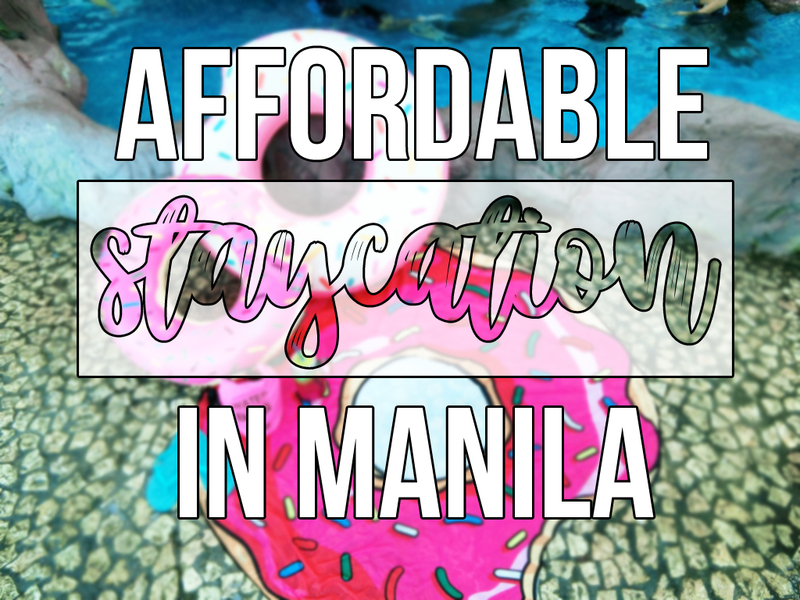 BSA TWIN TOWERS Blog Review | Affordable Staycation in Manila! 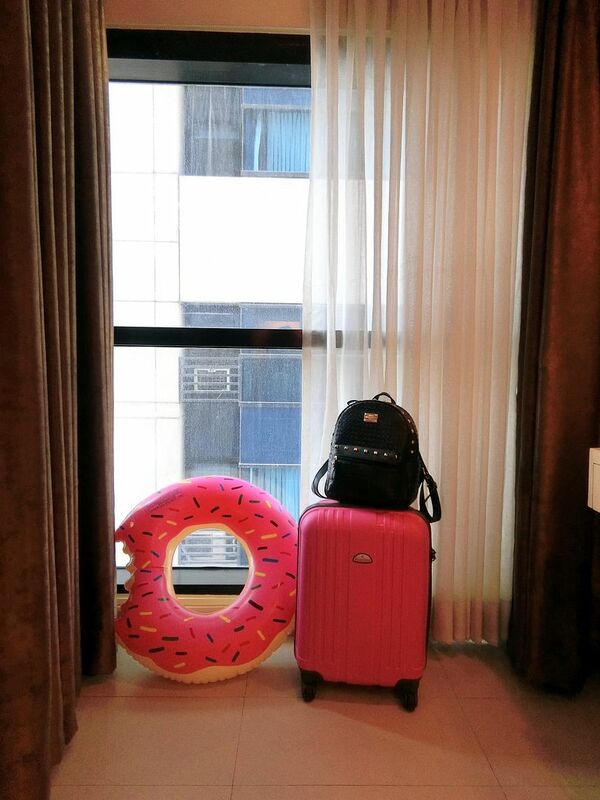 Aside from going out-of-town on a long weekend, getting a nice room at a hotel is also considered fun these days! Hence the term STAYCATION. 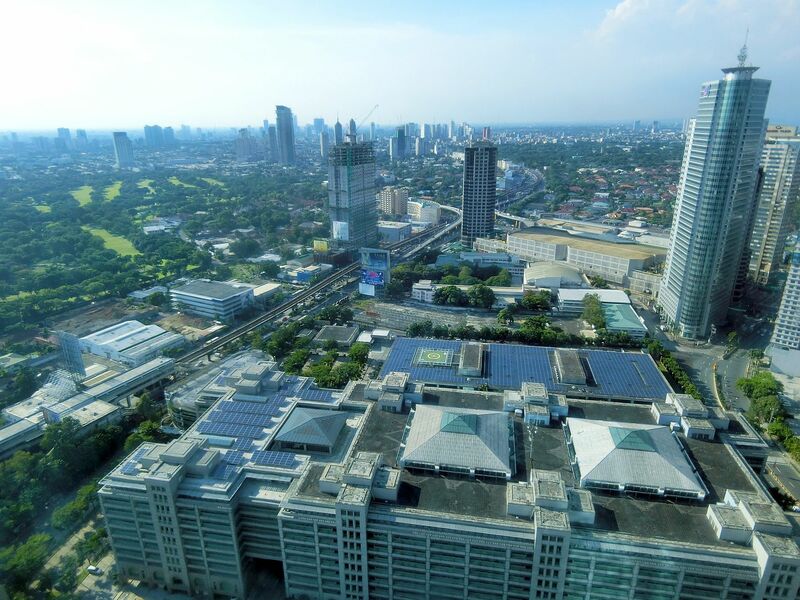 Going to a nice beach and staying at a luxury hotel outside Manila seems enjoyable until you find yourself stuck in traffic or at a jam-packed tourist spot. Did you know there is a nice and inexpensive CONDOTEL you and your family/friends could stay at? 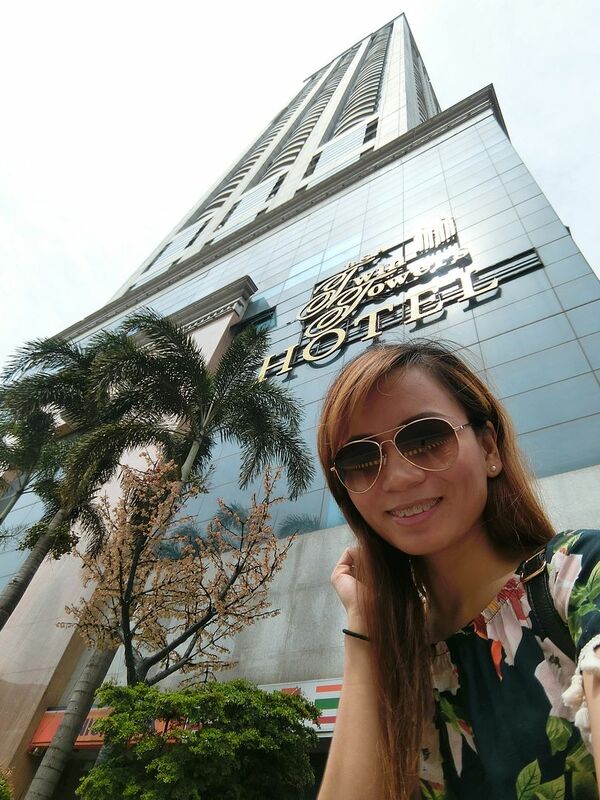 I discovered it when I was searching for a nice hotel around Metro Manila. The most important factor for me at that time was a place that has an "outdoor" type of pool because I needed to film a Summer-themed video for my YouTube channel. Google gave me few suggestions until I found BSA TWIN TOWERS. 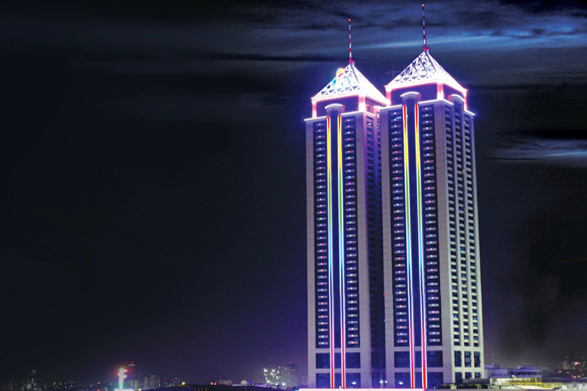 Do you know that colorful high-rise twin-tower you see when you pass by Ortigas at night? Yessss, it's that building! Who who have thought there is a nice place situated right behind SM Megamall, right? Neither did I think it was possible! 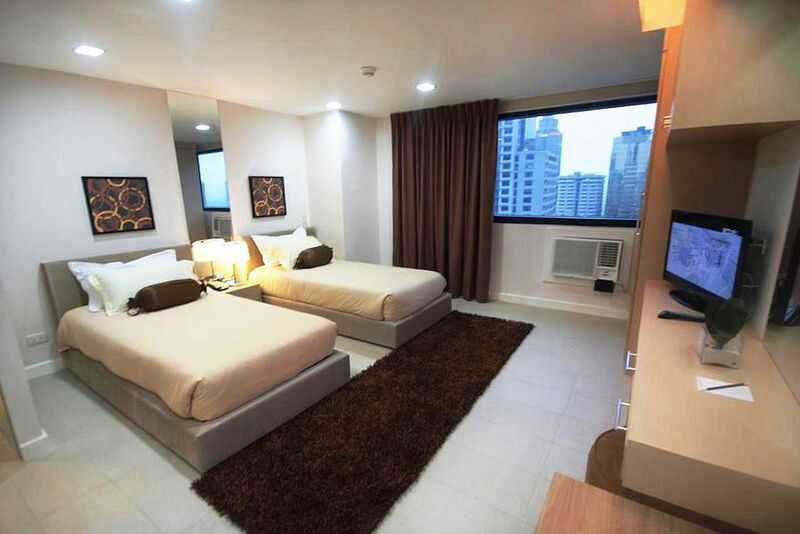 THE PLACE : It is a condo-hotel that is set in a prime location within St. Francis Square, right behind SM Megamall. 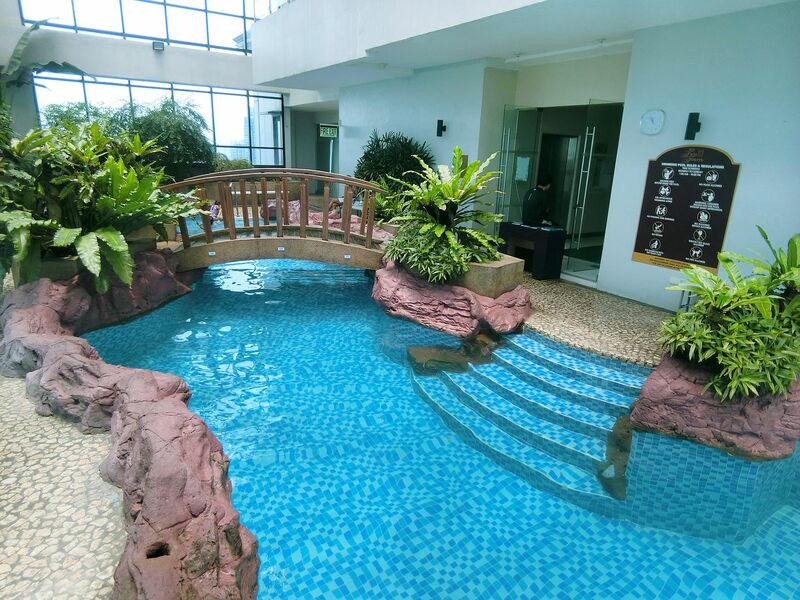 It puts you close to corporate hubs and leisure spots. 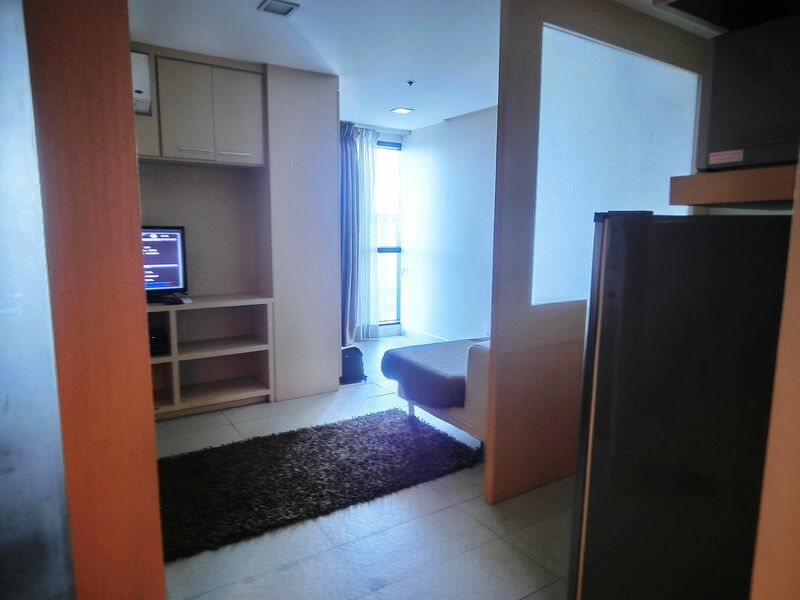 STUDIO PRIME is a 34m2 bedroom that has either 2 single beds or 1 queen-sized bed. Studio Prime is a studio-type room that has an open concept. Once you enter the door, you will see the bathroom, the dining space, the beds, the entertainment space and the windows. From the side of the windows, you will then see the kitchen area. The say, I say, is perfect for a small group, preferably of 2 people. They initially give the room to you with 2 separate single beds but you can always call housekeeping to combine the beds to transform them to 1 large bed. Perfect for sharing, it can even fit up to 4 people, I say. 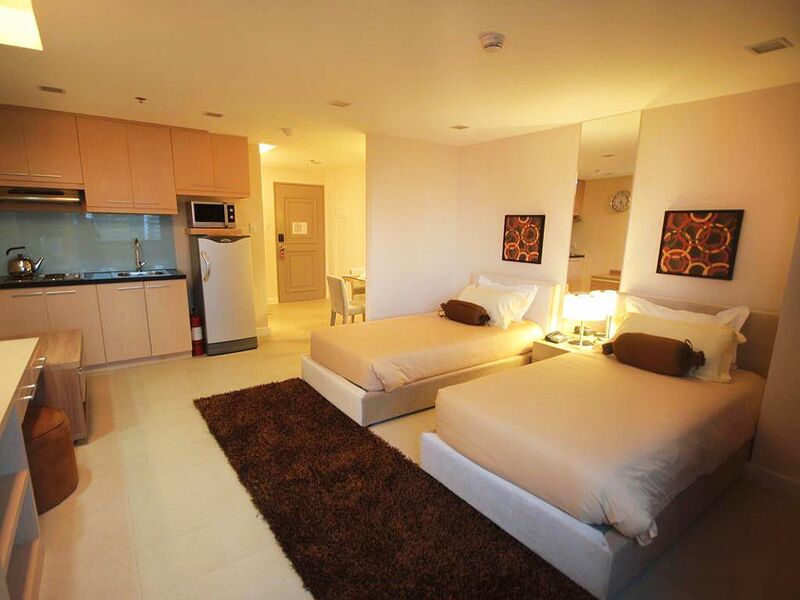 STUDIO PREMIER is a 39m2 bedroom that has either 2 single beds or 1 queen-sized bed. The Studio Premier is bigger than the other room I have mentioned. I was quite surprised it looks different from what BSA put on their Agoda page where I booked. From Agoda, it shows an L type of floor pan. But when we got to the room, it was the usual square type of room. 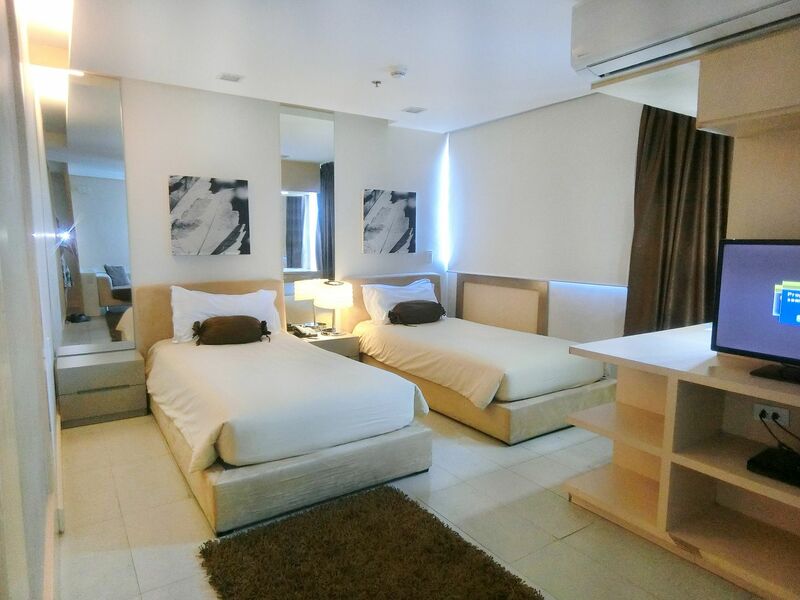 Anyway, it does not have a separate room but it has divisions that would give you enough privacy, if you are staying with quite a number of family members or friends. When you enter the door, you will see the bath room, the dining space and then you will see the divisions. In front of the division to the right is the kitchen area. 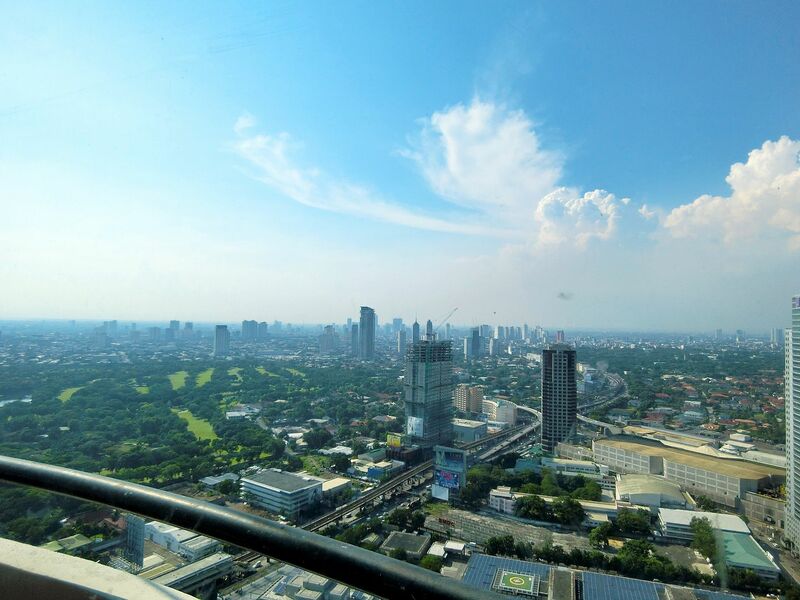 Behind it is the living space that has a couch and a huge window that showcases the spectacular view of Ortigas. To the right behind the division are the two beds and the entertainment area. I loved how it is still open to allow conversations while giving ample privacy when some are eating or cooking while the others are laying on the bed. They have 2 pools, by the way. 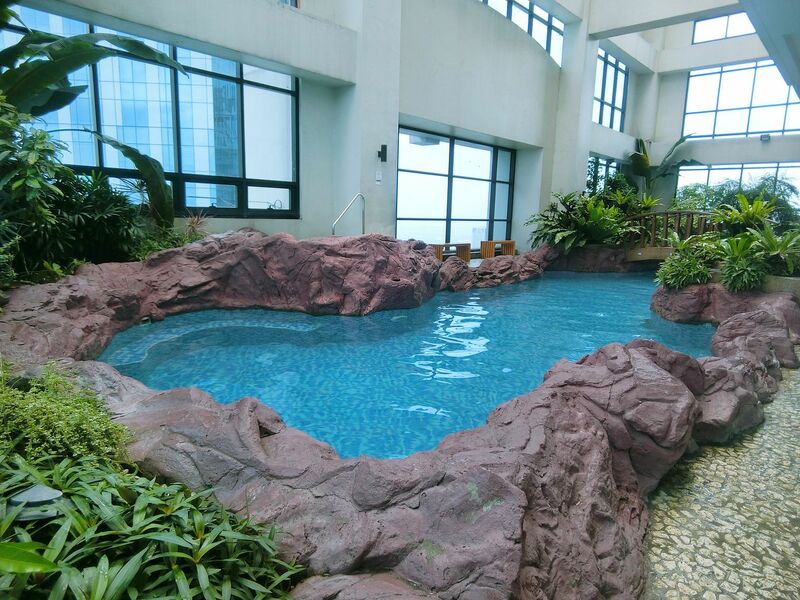 One is this pool and the other, which is a wider lap pool, is located on the other side of the tower. If you want to see the video that I did here, you can watch it below. The pool is great however, based on my 3 stays at the place, the pool could get really jammed sometimes while in other cases, it's empty and private. Also, there was one instance where we swam in it and the water was so fresh, almost no hint of chlorine while in another stay, the water felt almost like 90% chlorine. Also, when I filmed this video, floaters were still allowed. But when we came back for another stay, floaters weren't allowed anymore to give more space for people. This was our view from the window on top of the beds. This was our view from the window in the living area. 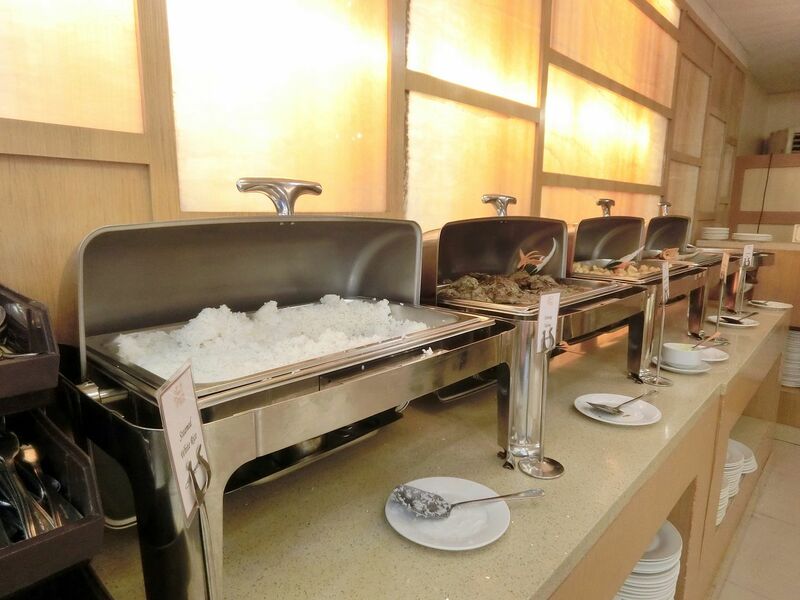 Buffet Breakfast is free and it's also satisfying. 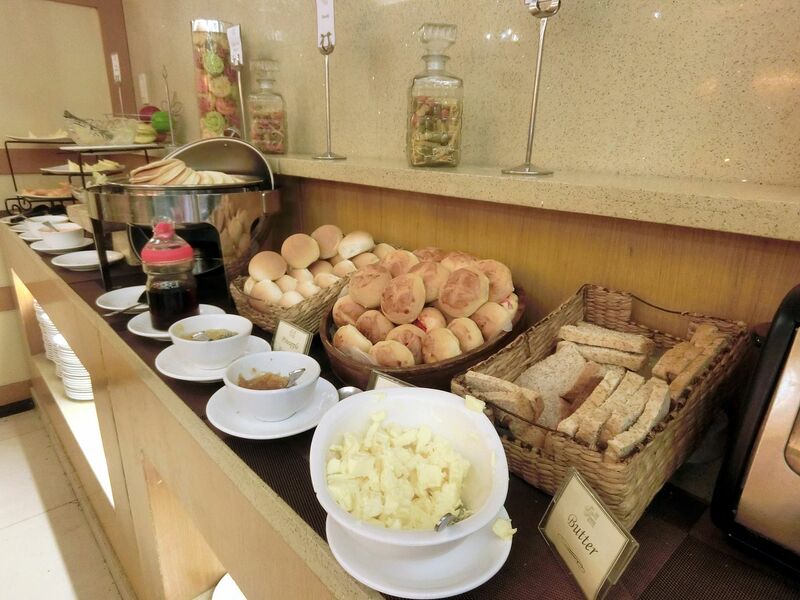 Of course, you can't really compare it to buffet breakfast at 5-star hotels. But for the price you paid for it, the breakfast is fulfilling. I can eat platters and platters at dinner buffets but for breakfast, I just couldn't take so much. What they offer at the BSA, I must say, is just the perfect breakfast. They mostly have 3-4 viands, rice, an egg and pancake section, soup, breads and cold cuts, fruits and salad, and coffee and juice section. What sets this apart from other hotels is that it's not entirely a hotel but a CONDO-TEL. Meaning, aside from staying at a relaxing room, you also have the freedom to move around as if it was your own home. They have a kitchen area when almost everything you need for cooking is provided. They have 2-burner stove, a full-size ref, a microwave oven, a pot and a pan, 2 sets of dining wares like plates and cutlery. The food must be provided by you, of course. 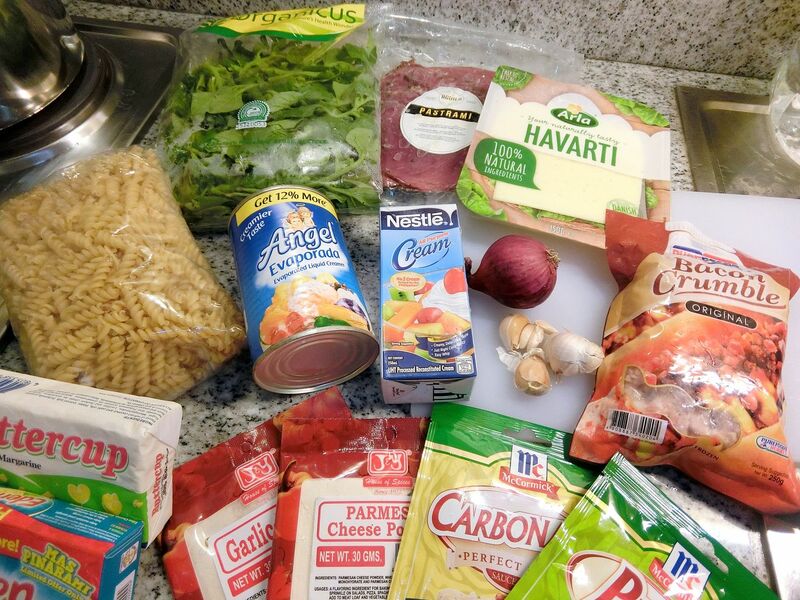 On our first stay, I made Carbonara pasta and sandwich. On the second stay, we made bread and coffee jelly. On the third stay, my BF cooked sinigang. 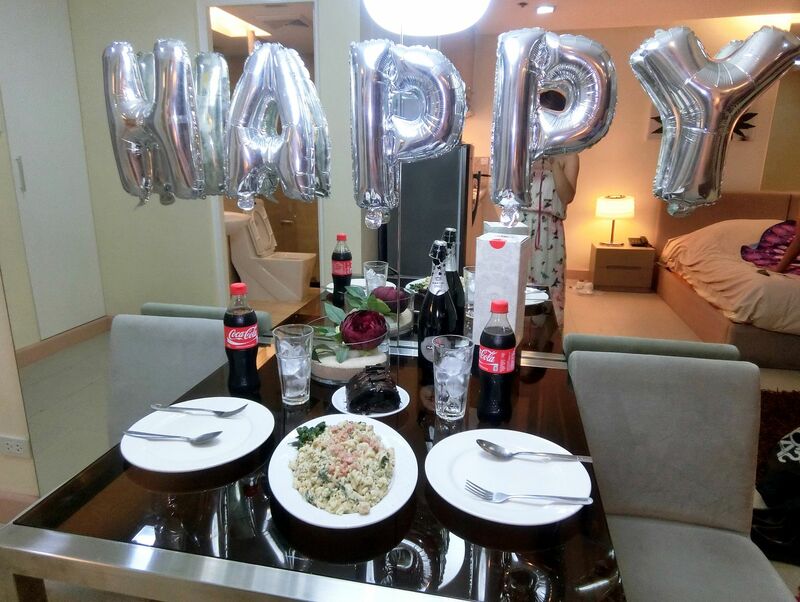 It's a great place if you want to celebrate a special occasion but don't want to have to go through the fuzz of decluttering and tidying the place after. Those are just some of the good points of the place. Now, let's go to the bad points that are somehow disappointing. WHERE TO BOOK : I always book my travels and hotels on Agoda.com. I find that the site is safe and reliable. I've used to many times : El Nido, Hong-Kong, Singapore, Philippines, etc. What I did not like about BSA is that checking-in takes soooo much time. They have 2 lobbies (because they have 2 towers), but they are always full and busy. 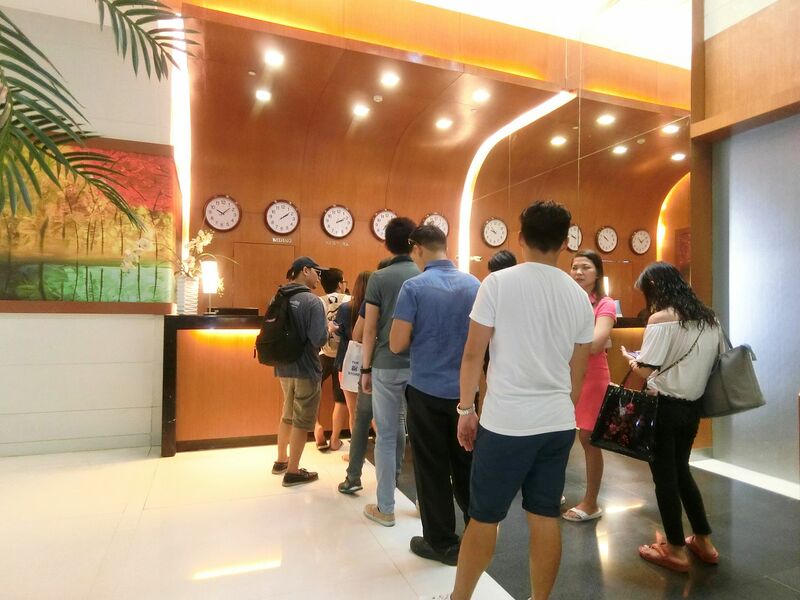 I'm not sure if it's due to the small space of the lobby, the few number of hotel lobby receptionist or the inefficiency of their check-inn system. It always takes an hour to check in! *my gulay!!! 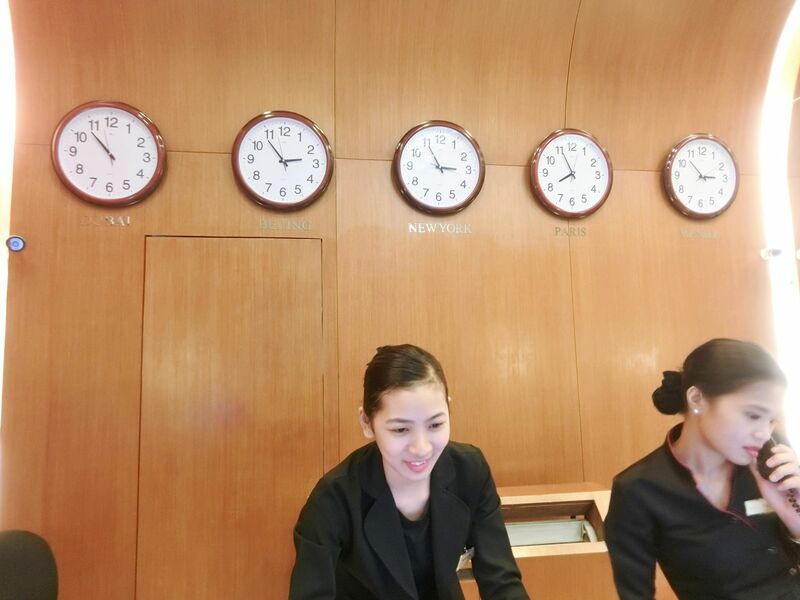 * In the picture, you can see the Manila time is almost 3:00 PM but we still haven't checked-in. The line behind me was so long, people were getting impatient. Guess what time I got there. Yup, before 2 PM. And when I got there, there were about 3 people in front of me. I was already the one being checked-in when I took this photo. So, it means it takes them an hour to assist 3 people! Crazy!We always have that experience so sometimes, we just opt to arrive later than 2 PM. Which, also lessens our time in the hotel. SO SAD! I wish they can do something about their check-in system. Also, upon booking at Agoda, you will be asked for your requests : high-floor room, no-smoking, 1 large bed... etc. But when you get to the reception and once you enter the room, you will realize non of those requests were granted. UNLESS, you call the reception and tell them it wasn't the room you requested or if you say it right away while checking-in at the reception. Of course, it's always upon availability of the room. But I always get the same thing whenever I stay. So, it must be culture. Remember, I said that when you are lucky, you will get a nice room with a spectacular view? Well, if you're unlucky, you sleep and you wake up to the view of windows. Flat, dead windows of the other tower. Out of our 3 stays, we experienced this twice. It was so sad we wanted city view but we were given garden view. But the place is nice, considering the amount you're paying to get a relaxing weekend getaway. This has become my secret go-to place in Manila when I feel like taking a break. I was skeptical in sharing because I didn't want the place to be fully-booked when I want to stay. *hehe* But I thought people might be interested to stay at a relaxing and inexpensive condo-tel in Manila. If you ever decide to stay , please do hit me up by tagging me on your pictures on social media. I would love to know you liked my staycation recommendation!